At long last! A story for those who love wilderness and the adventuring spirit. 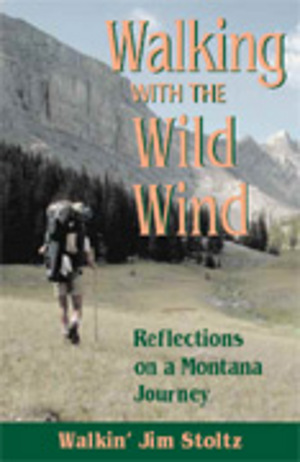 Walking With The Wild Wind is a book that will take you to the wild places, a story that shares the ups and downs, the joys and sorrows of a wilderness wanderer. Put on your hiking boots and come experience the laughter, the fears, close calls and magical times of a unique backcountry journey. Folksinger, adventurer, photographer, activist and artist, Walkin' Jim Stoltz has taken to the backcountry of North America, walking the last wild places for months at a time, nearly every summer since 1974. For over thirty years Stoltz has celebrated the natural world through his songs and concerts. Now he shares his unique view of the wilderness through this personal tale of a trip through the heart of Montana's last roadless areas. He introduces us to the life of a long-distance walker, and gives us a view of the natural world many of us will never get to experience. Jim's close calls with natural obstacles (brush fires, falls off mountains, wildlife encounters, and river crossings) are woven together with both humorous tales and more serious issues, such as the impending death of his mother and the loss of wilderness. This book is a must for anyone who has ever tossed a pack on their back and taken off into the mountains, and for all those who have dreamed of it, too.